Part 1 Place: The changing teaching and learning environment; Transforming the library – e-books and e-buildings. Part 2 People: Online social networking, the e-learning holy grail? E-Learning models: A Web 2.0 approach to staff development in higher education. 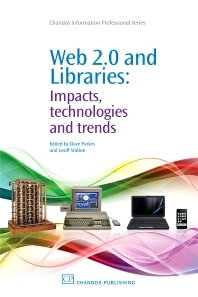 Part 3 Technology: A deployment strategy for maximising the impact of institutional use of Web 2.0; Emerging technologies for learning. Part 4 Conclusion: Meeting the challenge. David Parkes is Associate Director of Information Services at Staffordshire University. He is a Fellow of the Higher Education Academy, and writes and speaks widely on the provision of information and digital literacy, e-books and emerging technologies to other universities, publishers, academics and other librarians. He sits on the New Media Consortium Horizon Report Project board for 2010, and a number of publisher advisory boards. He has recently undertaken consultancy for the Oxford University Russia Fund to help develop e-book provision in Russian Universities. He is also Head of the Special Collections and Archives and chairs Inspire West Midlands, a co-operative cross-sector access scheme involving all UK primary health care trusts, higher education, further education, public and special libraries in the region.